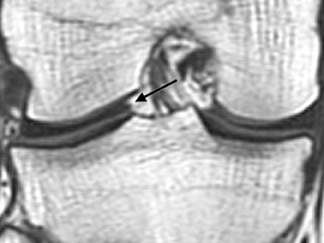 Magnetic resonance imaging (MRI) revealed an elongated free edge of the diffusely enlarged lateral meniscus extending toward the intercondylar region on coronal T1-weighted images (Figure 1A). 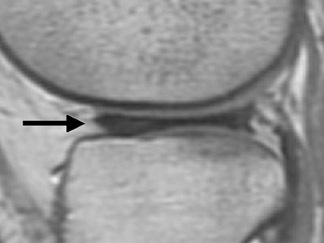 Continuous meniscal tissue bridged the anterior and posterior horns of the lateral meniscus on 3 consecutive sagittal slices (Figure 1B). The intrameniscal signal in the anterior horn was compatible with mucinous degeneration. The etiology of discoid lateral meniscus is still debatable, although opinions in the literature tend toward a congenital origin. The reports of additional anatomic variations complicate the original etiology theories and support the concept that discoid lateral meniscus may be due to multiple etiologies. The most commonly practiced treatment for stable, complete, or incomplete types of discoid lateral meniscus is partial meniscal excision. In this case, our patient underwent surgical excision, leaving a 6- to 7-mm peripheral rim circumferentially, anteriorly, and posteriorly. Postsurgically, the patient continued to have pain and decreased extension of the knee. She had to undergo a second knee arthroscopy to remove more of the meniscus and remaining scar tissue. The patient is now doing well and currently reports no pain or limitation in movement. The diagnosis of discoid lateral meniscus is easily rendered on MRI. Invasive surgical treatment for discoid lateral meniscus is effective for symptomatic relief but is recommended only if the symptoms of the condition become significantly problematic. Dickhaut SC, DeLee JC. The discoid lateral-meniscus syndrome. J Bone Joint Surg Am. 1982; 64:1068-1073. Klingele KE, Kocher MS, Hresko MT, et al. Discoid lateral meniscus: Prevalence of peripheral rim instability. J Pediatr Orthop. 2004; 24:79-82. Asik M, Sen C, Taser OF, et al. Discoid lateral meniscus: Diagnosis and results of arthroscopic treatment. Knee Surg Sports Traumatol Arthrosc. 2003;11:99-104. Bin SI, Kim JC, Kim JM, et al. Correlation between type of discoid lateral menisci and tear pattern. Knee Surg Sports Traumatol Arthrosc. 2002;10:218-222. Nawata K, Teshima R, Ohno M, et al. Discoid lateral menisci in older patients. A radiographic study of 21 cases. Int Orthop. 1999;23:232-235. Araki Y, Yamamoto H, Nakamura H, Tsukaguchi I. MR diagnosis of discoid lateral menisci of the knee. Eur J Radiol. 1994;18:92-95. Samoto N, Kozuma M, Tokuhisa T, Kobayashi K. Diagnosis of discoid lateral meniscus of the knee on MR imaging. Magn Reson Imaging. 2002; 20:59-64. Chiang H, Jiang CC. Discoid lateral meniscus: Clinical manifestations and arthroscopic treatment. J Formos Med Assoc. 2003;102: 17-22. Discoid lateral meniscus. Appl Radiol.